Canopy: professional services automation, for professional security and audit teams. Canopy helps security and audit teams manage and deliver their security assessments faster and better. Teams can easily stay on top of their workflow, track projects from start to finish, and quickly go from raw results from tool data and manual findings to high quality reports. Canopy brings efficiencies to teams, and reduces costs for the business. One of Canopy’s main benefits is centralisation of all of the useful information relating to the security assessments your team manages. No more searching for delivery and scheduling details in emails, or relying on inefficient document repositories for managing documents. Canopy provides you with a system to help manage and coordinate assessments effectively with team members. Canopy comes with an incredibly flexible reporting solution. As most of our users have based their reports around Microsoft Word, we developed a template system that builds on this familiarity. Report templates can be built to adapt deliver simple executive summaries or complex detailed vulnerability assessments. 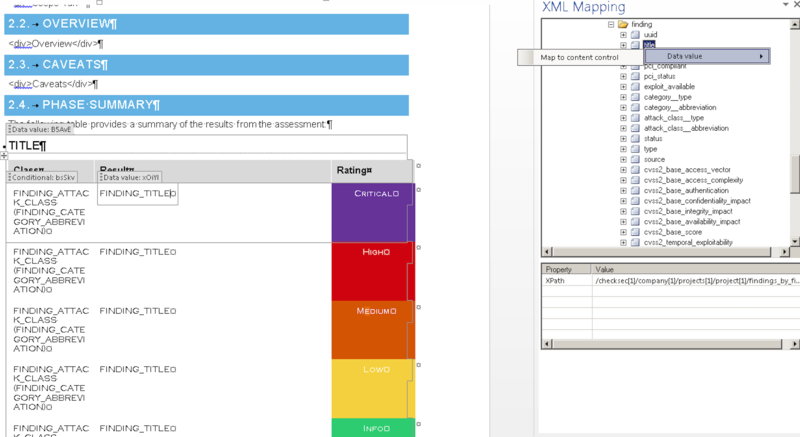 Some of our users have templates covering each major assessment type, for delivering PCI ASV and other standards-driven assessments, and more. Canopy allows you to adapt your previous reports easily, or you can design completely new reports. Report Templates can store reusable content, so you can get a head start when writing your interim updates or final reports. The Knowledge Base allows you to create and manage reusable finding write ups, so you don’t have to start all over again on each engagement (or try to find the latest write up from the previous report). The addition of Methodologies helps teams focus on what’s important during delivery, without getting in the way of creativity. By using report templates and the Knowledge Base, it becomes quicker than ever to write security reports. Canopy also supports processing and grouping findings, to ensure you’re reporting what the client really needs. You can quickly import your tool data, add evidence, remove false positives, group common issues together and generate the report with the click of a button. All through simplified, web based, workflow. 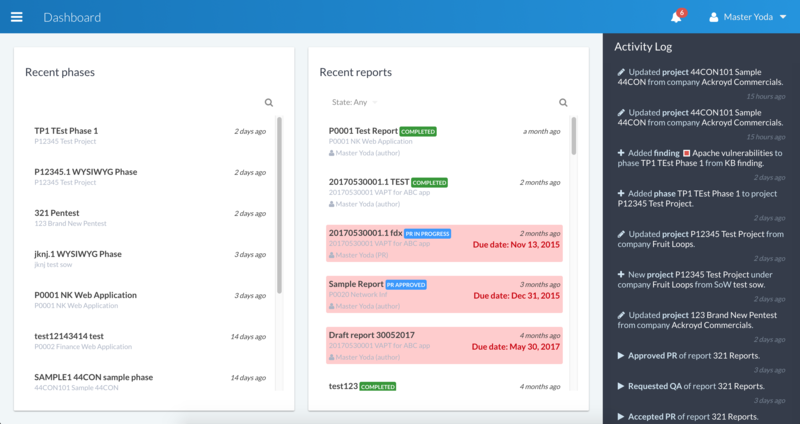 Canopy comes with a built in scheduler that allows you to easily assign team members to assessments. The scheduler's focus is providing a replacement to spreadsheet scheduling hell. One of the major problems testers face during assessment delivery is sharing information and ensuring that the results are up to date. Canopy provides a collaborative, multi-user, system for teams that helps them keep up to date and focused on delivering what matters. Canopy is web based technology and an on-premise solution. CheckSec does not host your data. All of the data stored in your instance of Canopy remains on your servers. You're free to deploy locally or in the cloud. You choose. Canopy's licensing model is based on a subscription service. We have packages that scale to suit small teams and large organisations. Contact us for further information. We pride ourselves on delivering first class support. We will help you get up and running quickly with Canopy by assisting you in mapping your first report templates and helping you populate the Knowledge Base. We can also help you design new reports, and provide you with advice, guidance and support throughout your license period. Everyone in the industry has wanted a product like this for the past 10 years, now someone has finally built it. Canopy has helped us increase efficiency, and improve the quality of our work. CheckSec have proven to be a reliable and flexible partner to Security Alliance. Canopy has become a key asset for our business, and enables us to quickly generate high quality custom reports for our clients, and helps us deliver a consistent service across multiple test teams. We are strong proponents of CheckSec and the Canopy reporting platform. We’ve been using Canopy for all of our Penetration and Application Security reporting requirements. It’s easy to use and the support is amazing. I wish I’d had Canopy in a previous life. If you’re not using Canopy, you’re not winning. © 2019 CheckSec. All rights reserved.